The metro’s first attempt at a public toilet was a failed pilot project at the Prospekt Mira station in September 2015. That lavatory was free-of-charge but closed after a couple of months. World’s deepest metro led to much discomfort when nature suddenly called. The Moscow Metropolitan, which is the world’s second-busiest with 2.5 billion riders every year, will soon get several dozen permanent public lavatories. Passengers have requested them for years, suffering silently as they held it in until they could exit at the next station, ride the escalator to the surface and run to a nearby toilet. The metro’s first attempt at a public toilet was a failed pilot project at the Prospekt Mira station in September 2015. That lavatory was free-of-charge but closed after a couple of months because passengers were highly critical of the toilet cabin, said Yuri Degtyarev, first deputy head of the Moscow Metro operator, Moskovsky Metropoliten. A tender is currently underway to choose the new lavatories, and more information can be found on the Moscow Metro’s official website. In total, there will be about 38 pay toilets with CCTV cameras and alarm buttons, located at major stations and open from 7:30 a.m. to 11:00 p.m. The Moscow Metro has approximately 240 stations in total. The cost of a lavatory visit has yet to be determined, but payment will be made with a contactless Troika travel card. Tender results will be announced on Feb. 1. By comparison, the New York City subway officially has 130 free public toilets in its 470 stations, but most are locked or have been converted into commercial kiosks. The Paris metro also has free public toilets, but they are often the target of much criticism and riders prefer the above-ground sanisettes. 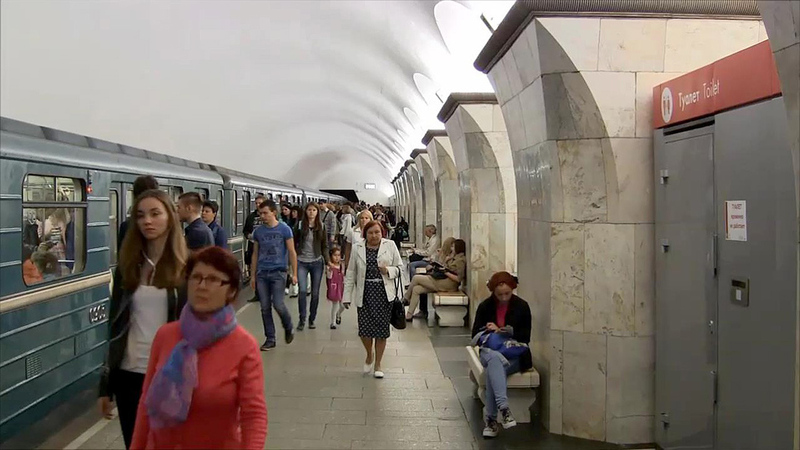 The Moscow toilets will be installed at the following stations: Chkalovskaya, Mendeleyevskaya, Kitay-Gorod, Tretyakovskaya, Sretensky Bulvar, VDNKh, Prospekt Mira (Circle Line), Komsomolskaya (Circle Line), Kiyevskaya (Filyovskaya Line), Tsvetnoy Bulvar, Taganskaya, Sokolniki, Kropotkinskaya, Krasnopresnenskaya, Delovoy Tsentr, Park Kultury (Radial Line), Semyonovskaya, Belorusskaya (both Circle and Radial lines), Ploshchad Revolyutsii, Pushkinskaya, and Mayakovskaya; the junction stations Biblioteka Imeni Lenina, Borovitskaya, and Aleksandrovsky Sad stations will also be outfitted.